John (Jack) Perry: Flying Officer, RAF Volunteer Reserve 161 Black Squadron. Victor Martin Grant: Flying Officer, RAF Volunteer Reserve, 406 Sqdn. Reginald Arthur Henry Allen: Flying Officer (Nav. ), RCAF ACC. 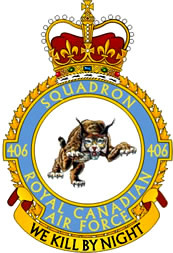 Royal Canadian Air Force 406 Sqdn. George Bishop: Flying Officer, RCAF Ops. Royal Canadian Air Force 406 Sqdn. Hugh John Findlay BA. LL.B: RCAF ACC. Royal Canadian Air Force 406 Sqdn. Robert Clarke Green: Sergeant RCAF Ops. Royal Canadian Air Force. Joseph Emile Arthur Hebert: Corporal RCAF ACC. Kenneth Bradley Hicks: Pilot Officer RCAF Ops. Royal Canadian Air Force. 406 Sqdn. John Ballantyne Kennedy: Flight Lieutenant. RCAF Ops. Royal Canadian Air Force. 406 Sqdn. James Francis Lawless: Flying Officer RCAF Ops. Royal Canadian Air Force. 406 Sqdn. Gordon Charles Moir: Flight Sergeant (Pilot) RCAF FLY ACC, Royal Canadian Air Force. 406 Sqdn. Peter Talbot Reid: Flight Lieutenant RCAF Ops. Royal Canadian Air Force. 406 Sqdn. Robert John Sloan: Flying Officer (Nav.) RCAF FLY ACC. Royal Canadian Air Force. 406 Sqdn. Thomas William Trewin: Flight Lieutenant, RCAF Ops. Royal Canadian Air Force. 406 Sqdn. Edwin Karl Vickers: Flight Sergeant (W.Op/Air Gnr.) RCAF FLY ACC. Royal Canadian Air Force. Sponsored by Jackie Freeman Photography.